* I have a serious question to ask you. I want to be a budgeting blogger, a real girl, with a real budget, but from time to time companies/brands/small boutiques offer me the opportunity to pick out clothing for free. How would you like to see these "c/o" items covered? Included in my budget? Ignored? Featured in a separate post? Let's chat. Looking for more budgeting bloggers? Come join me over on Franish's shopaholics anonymous confession booth link-up! I feel like c/o items can be treated as gifts. You wouldn't include a gift from your mom/sister/friend/whomever in your budget. Just make sure it's very apparent that it's c/o and you're all good. I don't include my c/o items because for one I don't base my whole wardrobe off of what one or two companies sends me to feature for them... and for two because I really don't have that many companies that I work with for free clothing. I think those pieces are more "business" decisions that my readers probably wouldn't be that interested in. But my clothing budget is my very personal way of showing how I build my closet in a meaningful way - and that I think is worth sharing with my readers! yeah i am with breenah, i'd treat a c/o item as a gift. i think this is great, jessica!! love seeing your budget and how you're working through it! That blazer is such a gorgeous color. I'm off to scope out the J.Crew Factory final sale area now! If your budget is about keeping yourself on track money-wise, I don't think you should include your c/o items in your budget. One of the perks of blogging is getting free swag once in a while, so in a way it's just like getting paid in something besides cash money. Basically if you didn't spend money on them you don't need to act like you did. Unless you want to! P.S. Super impressed you only spent $90 this month!! What a BUY that that J. Crew skirt is–I'm jealous! I wouldn't include c/o items in the budget since you're not actually spending money on them. I agree with Breenah, I think you should consider c/o items gifts. You did AMAZING this month girl, so proud of you! That bracelet? I've been wanting one! What great finds!! AND at only $90! I love every piece! I would love to hear about them and know what you are receiving (its nice to see what the break down is) but count them as a gift like others say. I love this and I have that same skirt in my cart, just trying to decide which tops I want without breaking the bank, but i can not wait for it to come! Love that bracelet and the blazer! I like that you put a purchase and returned, too. I never thought of that! I love how thrifty you are! Looove that bracelet! Great picks! I was just saying the other day that J. Crew Factory has gone crazy with their sales this year, and I love it!! I may have gone today and basically spent most of my August budget even though August doesn't start until tomorrow... oops? I've never had an issue with their quality though so why not grab some great pieces for a fraction of the cost?..... I agree that your c/o items should be treated as gifts. You've worked really hard on your blog to get to a point where companies are offering that stuff so you deserve to take advantage! I wouldn't include those in your budget because technically you didn't spend any of your own money on them. 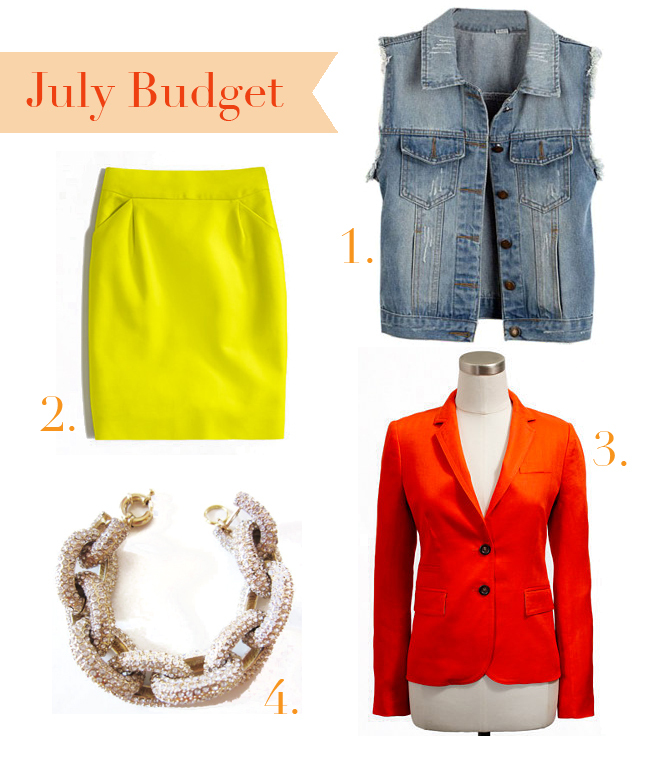 However, it would be fun to share those pieces in your July budget page a little farther down just because it's always fun to share new clothes! Wait so are the J Crew Factory prices in store? Online they are nearly twice that! Ooh I love your purchases this month! I bought the same J.Crew factory blazer (um yes, totally loving their permasales) but in the aqua color, though I might be selling mine because it doesn't quite fit right and I don't 100% love it. As for disclosing sponsored items, I struggled with that decision too, and I decided to just list mine anyway (not that I'm getting a whole lot, haha). I think it's fine unless you're continually getting like tons of items a month and listing them all out would feel more like bragging or showing off than a recap of the items that you added to your closet every month. I'd love to see you include them! I love the idea of making a budget and sharing how you spent the budget with your readers! It's a fun way to keep track of purchases and also to stay accountable. Budgeting is something I really need to work on. So glad I found your blog! Following now. Oh, and I would not count c/o items. It is like a gift, IMO. I don't think c/o items need to be included in your monthly budget posts if you didn't pay anything for them. I'd just always make sure to label an item as c/o when you show it on your blog. I love love LOVE that blazer! Such a fun fiery color! And I adore J.Crew factory. I grew up with a store in my town and now that they're online, so dangerous :). I agree with everyone that you don't need to include c/o items in the budget, but it is fun to see what you get! I always include items that I got through credits from referral links, though, as a big thank you to my readers! Holy cow those J.Crew Factory pieces were a STEAL! They aren't that cheap online but still a good price...I might have to check out that blazer in store if they still have it! And I wouldn't include the C/O items because you really don't pay for them, but it might be cool to show what they are as a sidenote or additional post because I'm sure we are all curious to see what gorgeous goodies you get! My J.Crew Factory shopping tip: wait till the listed prices are an additional 40% off... it will inevitably happen. So even though this blazer is listed as $48.99, after the additional 40% promotion that is running RIGHT NOW it is only $29.39... SCORE! I love that gorgeous red blazer! You could include c/o items in the budget listed as a gift, but I don't necessarily think that's necessarily. Especially since budgeting is mostly about sharing what you spent your money on. Also, I am looking at the J.Crew sales right now!! I've been noticing that you seem to receive a LOT of c/o items, which must make it really easy to stay within a budget. That also makes you way less relatable to those of us average people who actually buy all our clothes ourselves. Lisa, thank you for your comment. I know that I am not going to be able to make everyone happy all the time, but I would love to hear more about your suggestions for this situation. Would you prefer I deducted what I would have paid for the items from my budget? I don't think your c/o really need to be included in your budget. Maybe mention them (like I had a month where I received a few c/o items and items on credit from everlane) and so I mentioned that because I got those few items, I felt less of a need to go buy other things. I don't know, it's tricky! I think courtesy items are part of your "salary" for being a blogger. Therefore, they don't really count towards your clothing budget. Honestly, one rarely absolutely *needs* new clothes, so your budget is still very relatable to someone who doesn't receive free items. Here, you've showcased four amazing buys at $100, that anyone that reads your blog could get. You did an AMAZING job this month! I think the c/o items don't need to be in your budget posts because you didn't actually purchase them. But they don't need to be in a separate dedicated post either because that will just make me super jealous! ;-) Keep sprinkling them into your regular posts! I love this post! Do you decide on certain pieces that you want at the beginning of the month, or do you just go with the flow? This month I just went with the flow - hoping to plan some special purchases in August for my Birthday! !